Size: The Pelagic Sea Snake is generally less than 90 cm long. Females are significantly larger than males and may reach a total length of 88 cm with a tail length of 9 cm, while males reach 72 cm in total length and 8 cm in tail length. Unlike other sea snakes, this species occurs in the open ocean (pelagic zone) well away from coasts and reefs, sometimes far out at sea, but most plentiful in clear, warm, shallow water where surf and currents are weak. Although the snake is an effective swimmer, it is usually found passively drifting with marine currents in the 0 10 m range of the water column, often in large numbers in association with long lines of debris. It is a surface feeder and preys exclusively on fishes, using a float-and-wait feeding strategy to immobilize its victim with an injection of strong nerve poison. It is active both day and night. The female gives birth to fully developed live young, which are born in the open ocean. When the snakes periodically shed their skin, like all snakes do, they twist themselves into a knot and run the whole body through it, which also allows them to clean off barnacles and other invertebrates that may temporarily settle on them. This only truly pelagic species is the most widely distributed of all sea snakes, occurring in the tropical parts of both the Indian and the Pacific Ocean. It ranges from the east coast of Africa, through the Arabian Gulf and the Gulf of Oman, eastward along the Asian coast of the Indian Ocean throughout Indonesia and Australia to the Pacific Ocean, extending to the western coast of the Americas. The IUCN Red List of Threatened Species classifies Pelamis platura as Least Concern (LC) in its global assessment. The laterally compressed body is comparatively short, but not stout, with the posterior part having about twice the diameter of the neck, and has the paddle-shaped tail typical of sea snakes, that helps to propel it through the water. The small, smooth scales covering the body are juxtaposed and hexagonal or squarish in shape. The head is small and narrow, the snout elongated. The eyes are relatively large and have round pupils. Aside from the body shape, another adaptation to aquatic life are small valved nostrils dorsally on the snout, which close when the animal is submerged. This dangerously venomous species has a pair of poison fangs frontally in the upper jaw (maxillary bone), with 7 11 solid maxillary teeth following posteriorly. 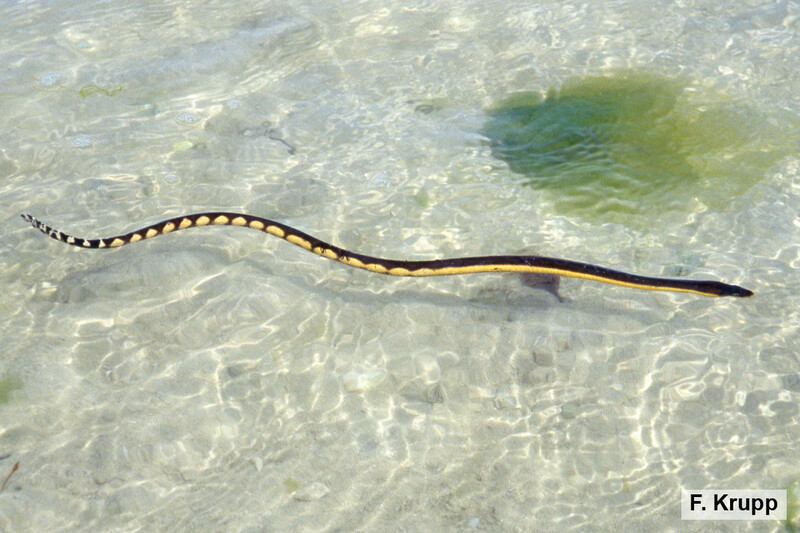 Coloration is extremely variable, but distinct from that of all other sea snakes with its unique contrasting pattern: the lower half of body and head is light brown or yellowish – hence the common name Yellow-bellied Sea Snake – and sharply delineated from the black, blackish green or dark brown upper half; the tail is yellow or cream-colored ventrally, with brown spots or bars dorsally. Variation occurs in the extent and shape of dark areas on the paler background.